Motorola is getting ready to introduce a new affordable smartphone that seems to be called Moto E. The company will host a press event next week, on May 13, and it could announce the handset on that day. Until then, though, it looks like we already have the first photo that’s revealing the Moto E (its white version, to be exact). According to Android Police, the photo was initially posted on Motorola Mexico’s Facebook page - and it’s no longer there at the moment. Anyway, the image - see it below - allegedly shows the Moto E (on the right) next to the already-launched Moto G (on the left). 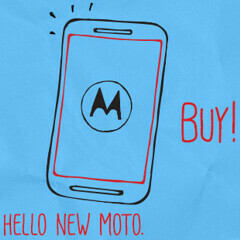 If this is indeed the Moto E, the handset is a bit smaller than the G model. It’s said that the display of the Moto E should be a 4.3-inch 720p one, and it appears that this is true (if we’re comparing it to the 4.5-inch display of the Moto G). There’s no way of telling what’s that thing below the screen of the Moto E - it’s shaped like a very long speaker grill, but it’s probably something else. Flipkart, one of India’s largest retailers, is currently teasing the upcoming Motorola smartphone, showing a sketch that certainly resemble the alleged Moto E which showed up in Mexico (including the weird stuff below the screen). The Moto E could be cheaper than the Moto G - which is sold for as low as $179 by Motorola. More details should be unveiled soon, and we’ll be here to bring them to you. The Moto E I must say doesn't look particularly good in terms of design as of what I'm seeing above. But if its priced right, it'll sell like hot cakes. From the second picture it looks like it is going to be below $100 phone. damn cheap one. Gaddamn... That's an ugly phone, even for its price. Maybe it's because of the white colour. In black it'll look sleek and if it's thin it would be real nice! I like it, it has the design similiar to DROID RAZR MAXX and Atrix. 50% of it are the ultralarge side bezels. Zauba database says-India imported moto e worth USD 2,662,090 with total quantity of 49,881. In india Moto E exclusive availble through Flikart immegiate after 13 may launch event.